“What? I’m fine,” I played off. I wasn’t fine or not fine. I was just me, and at that time being me meant that in big groups of people I felt uncomfortable. I’m not going to use the excuse that I was an introvert (because yes, I do believe many people use being an introvert as an excuse not to face their fears). At that time in my life, at nineteen years old, I was extremely self conscious around people I didn’t know because I didn’t really know myself. That age was all about meeting new people and making impressions, and I wasn’t sure the kind of impression I wanted to make. I only knew I didn’t want people to notice my self consciousness. A few years later, at just 22, I became a co-owner in a business. My business partner was a bubbly woman who is still a dear friend of mine. She was close to ten years older than me, and the first thing I noticed about her was that everyone wanted to be her friend. And I mean everyone. Her energy was infectious and upbeat. She laughed a lot and people felt good being around her. As we continued to work together and grow our friendship I found myself emulating some of her qualities. I started smiling more. I allowed myself to laugh. I started to become warmer with people. I had been afraid to let my guard down with people, and it felt good to smile and laugh more. I still felt uncomfortable in social situations. So I could sit here and give you a list of social hacks to make people more receptive to you and to make you feel a little more comfortable in groups. Power poses are great. They release endorphins from your brain and make you feel strong and powerful. Eye contact and asking questions shows people you’re engaged and interested. Some of these techniques work really well for people so go ahead and use them. There is a lot of value in knowing how to communicate and engage with people. However, in my experience, these tactics are treating the symptom instead of the cause. If you try these things on you might find a little more ease in conversation, but ultimately you will still feel somewhat uncomfortable in your skin. You might still get anxiety as soon as you’re invited to a social engagement. In the conversations there you might find yourself half listening to the person who’s speaking and mostly wondering how you’re being perceived. These situations are very familiar to me, but today I deal with very little social anxiety. There are times when I find insecurities creeping in, but I now know how to work with them. All the work I have done and the daily spiritual work I continue to do has allowed me to be more and more of my true self with those around me. 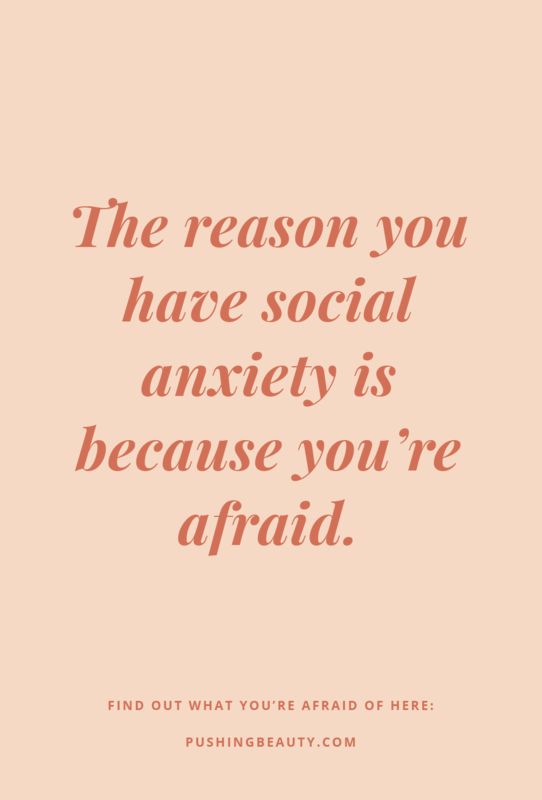 The real reason you have social anxiety is because you’re afraid. You are not actually afraid of being in social situations. You're also not afraid of making a fool of yourself. You're deep fear is that you’re not worthy of love. Much easier to hide behind the guise of social anxiety, right? This fear is so deeply hidden for so many of us and sounds so cheesy that we don’t readily admit it. Our fear is really good at keeping us stuck so we do anything to deny it exists. When you have a core belief that you are unlovable everything about social situations becomes a risk. If you show who you are you risk being rejected and proving your belief true. The fear is what creates the anxiety and, just like in western medicine, we treat the symptom instead of the root cause. The best tool I know to release fear and limiting beliefs is Breathwork. Using the right breathing pattern you can active your energy system and access the fear you’re suppressing. With it comes the false beliefs you’ve unconsciously adopted. You begin to see the truth about yourself more clearly: the light and dark of who you are. Breathwork is the ultimate practice that taught me how to love myself, and that is the true path to healing social anxiety. When you truly love yourself you accept yourself. When you accept yourself what other people think about you becomes such a minuscule concern if not a non issue completely. This is not an easy solution. The path to healing is full of highs and lows. You’ll have big breakthrough revelations about yourself. You’ll be flying high, and then something will trigger your fear and you’re back to work. When you begin to accept that life is about embracing the ups and downs instead of striving to wrap everything up with a bow the journey becomes much more enjoyable. You are about to walk into a room of 200 strangers. You are going to meet every single one of them. Each one loves you unconditionally. Each one thinks you’re one of the most fabulous people who exists. If you could feel their love and acceptance would you still feel anxious about walking into that room? That’s exactly the way you have to learn to feel about yourself. Make it your top priority to love yourself unconditionally and truly believe you’re one of the most fabulous person to exist, and then see how your social anxiety shows up.